KONSTANCIN-JEZIORNA, Poland (CNS) — Prominent Chinese Catholics have warned that a campaign to remove crosses from church buildings could signal wider restrictions on religious freedom, but cautioned Christians not to overreact. “Whatever those in power do, their first question now is how they can best serve their own interests, rather than socialism or any common purpose,” Archbishop Savio Hon Tai-Fai, secretary of the Vatican’s Congregation for the Evangelization of Peoples, told the ninth European Catholic China Colloquium in mid-September. “In this case too, there’s clearly something behind these nasty actions. 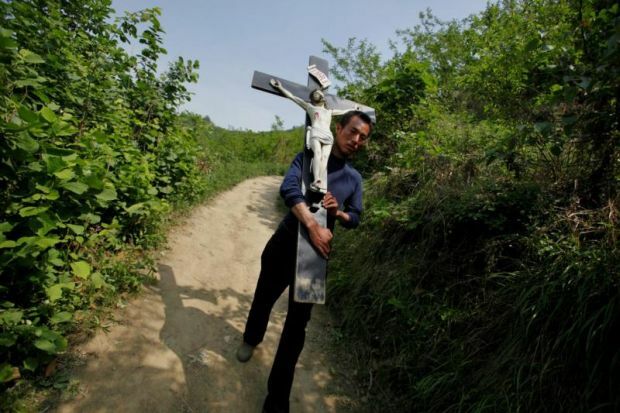 You don’t provoke the anger of the people by burning and ripping down crosses unless you want to achieve something,” he said, referring to the removal of crosses from places of worship in Zhejiang province, widely believed China’s most Christian region. In a Sept. 11 interview with Catholic News Service, Archbishop Hon said Zhejiang’s provincial Communist Party boss appeared to have been encouraged by central government figures to conclude he could further his career by attacking local Christians, at a time when Christianity’s rapid expansion was causing official unease. Father Paul Han, an official of the church’s Jinde Charities organization, based in Shijiazhuang, said he also believed government moves were now underway to reduce the “visibility of Christianity” in China, and he cautioned against a militant response. “Having previously been ready to encourage Christianity for its social and moral benefits, the government is becoming scared about its expansion,” he said. In 2014, local officials began tearing down crosses in the coastal city of Wenzhou, citing building regulations. Since then, they have removed more than 1,200 crosses throughout Zhejiang. However, Catholic sources said several churches had also been bulldozed and numerous Christians, including Protestant pastors, arrested for opposing the moves, adding that up to 4,000 crosses were believed targeted for removal from spires and towers by the autumn. Richard Madsen, director of the University of California San Diego’s Fudan Center in Shanghai, told CNS the anti-cross campaign signaled the failure of government efforts to contain grass-roots religious practices in China. He said local officials appeared to be resorting to “often inconsistent ad hoc policies” against Christianity. Father Bruno Lepeu, a French priest from Hong Kong’s Holy Spirit Study Centre, told CNS that China’s current president, Xi Jinping, had previously been Communist Party first secretary in Zhejiang province, and had thus clearly known about and approved the anti-cross campaign. He added that Bishop Paul Meng Qinglu, deputy chairman of the communist-controlled Chinese Catholic Patriotic Association, had been told in March that the government had ordered an end to the campaign, but said the cross removals had continued despite this. China’s Catholic Church is estimated unofficially at 14 million; Protestant churches are thought to number at least 50 million. Archbishop Hon told CNS he agreed that Chinese Catholics should be “very careful” not to be provoked into violence while seeking to protect their churches and crosses, adding that the Vatican would urge them to “follow the Holy Spirit” rather than recommending any concrete action. “As Christians, we should always be ready to suffer persecution for our faith — this is where wisdom and courage really lie,” he told CNS.